Already have your Postcards printed and want them direct mailed? Just ship your Postcards to us and we'll handle your mailing in accordance with the latest U.S. Postal Service direct mail requirements and pass postage discounts directly to you. Select the options for your mailing, upload or purchase your list(s) and we'll take it from there. The estimated Postage price is shown but is not charged to your credit card. Once we process your mail lists for Postal discounts and determine the actual Postage amount, we'll charge your credit card. A 4% merchant fee will be added to the Postage. The turnaround time to deliver your mailing to the Post Office is 1-2 business days after receipt of the materials and mail list(s). Postage must be received 24 hours in advance of delivery to the Post Office. First Class Mail is the best choice for time-sensitive direct mail and is generally delivered nationwide in 2-4 days. 4 x 6 and 4.25 x 6 postcards qualify for the First Class "Postcard" Postage rates. Postcards larger than 4.25 x 6 qualify for First Class "Letter" rates. Standard Mail offers lower Postage rates than First Class but with a longer delivery time. You can expect delivery within 5-14 days nationally and possibly quicker depending on the destination. Standard Mail does not offer a "Postcard" rate. The First Class "Postcard" rates are usually the lower-cost option for 4 x 6 and 4.25 x 6 Postcards. Non Profit postal rates are for organizations that have been granted a Non Profit status with the USPS. Non Profit direct mail is handled the same as Standard Mail with the same delivery times except the Postage is reduced. OnlinePintandMail can mail for your organization at nonprofit postage rates once you complete Postal Service Form 3623 plus a request for additional entry on company letterhead signed by a responsible organization official. 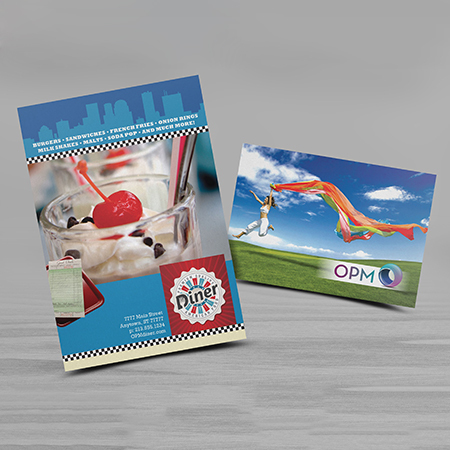 At Online Print and Mail, we realize how time consuming and tedious postcard mailing can be. Hence, we offer the most dependable postcard mailing service, in accordance to the latest U.S. Postal Service direct mail requirements. We want to change your perception of postcard mailing for the better. Provide your own mail list by uploading File(s) (CSV, EXCEL or TEXT).